* Claybord is available with our innovative and elegant cradles that provide extra support and presentation all in one. * The cradled panels will also save you framing and carpentry costs! Paints can be applied with brushes, sponges, paper towels, bristle brushes, air brushes and more. 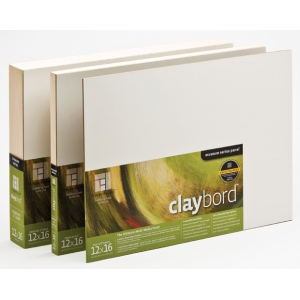 Claybord is an excellent printing surface and can also be used for Xerox or Polaroid transfers. With Claybord, pigments can be manipulated to vary tonal value, create detail, develop highlights and correct mistakes. Recommended tools include: scratchboard tools, hobby-knives, razor blades, etching tools, sand paper, steel wool, or electric erasers. Claybord's clay coating allows the use of sgraffito techniques to cut into the surface and re-expose the white clay ground as part of the creative process. The coating is 7 to 10 dry-mils thick allowing for multiple cut-ins or erasers. The smooth finish and the absorbency of the clay ground allows the use of an abrasive like oil free steel wool or sand paper to remove pigment without damaging the finish. While Claybord allows the use of traditional pigments, tools, and techniques, it is also an ideal surface for experimentation. The composition may be approached in a loose and expressive manner. Details can be added, highlights created, and mistakes corrected. These capabilities ensure a successful painting.